Flooding is a common occurrence throughout India during monsoon season, which lasts from June to September. 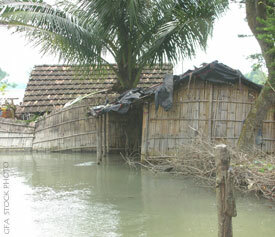 Abhinav Sen’s home and belongings were washed away when flood waters poured through his village in West Bengal, India. He and his family were left with nothing. Abhinav was already struggling to provide for his family, and this just added to the devastation. The cold winter weather was beginning to drift in, and he worried about what would happen to his wife and four children. When Gospel for Asia’s Compassion Services in the area heard about Abhinav’s distressed state, they sought to help him. GFA-supported missionaries gave Abhinav bamboo poles and a tarp, enabling him to provide a temporary shelter for him and his family to lay their heads down at night. This blessing opened doors for the missionaries to share the love of Jesus Christ with Abhinav. “For the first time, I witnessed that someone cares for me,” Abhinav said. He grabbed hold of the Gospel message, letting it take deep root in his life, and now he and his family joyfully serve the true God. Abhinav wasn’t the only one to receive a blessing from GFA’s Compassion Services. Nandan Bose faced similar circumstances from the flooding in his village. He and his family were left with a muddy floor to sleep on and no blankets to keep out the bitter chill of the impending wintery weather. Seeing Nandan and his family’s condition, GFA-supported missionaries presented them with a cot and two blankets to keep them warm. Now he no longer has to worry about finding a place to shelter his family. GFA Compassion Services provides physical and spiritual relief to families and individuals all across Asia who have been struck by natural disasters. Abhinav and Nandan were only a few people who received aid after the flooding in West Bengal last year. Donate to GFA’s Compassion Services. Read more stories about GFA’s Compassion Services. Learn more about the Indian state of West Bengal.